Your business also has the option of ordering a Custom Logo for a souvenir, gift, fundraiser, etc. You can either purchase individual Logos which will include in the package either a pendant chain & keyring or a pendant chain & ornament hook or a keyring & ornament hook or an ornament hook & wine charm set or a wine charm & ornament. This allows you the ultimate flexibility as you don't have to stock multiple items. A person can purchase a Custom Logo with the option to use it for 2 different reasons. A high resolution business logo would have to be supplied to us. Pricing is based on quantity and also the assortment of Custom Logos. We would send you a wholesale quote based on your requirements for resale. NOTE: You will receive a proof of your order. Once you approve the final proof (proof submitted to you within 2 days after receipt of order), you will be invoiced for the total amount due. Upon receipt of your final payment, your order will be produced. Please allow 14 days for production of your order and 4-5 days for delivery of your Custom Logos. Contact Outdoor Eyes Cards for a wholesale quote. MINIMUM NUMBER OF UNITS ORDERED: The minimum order for CUSTOM LOGO is 36 assorted pieces (combination of pendant, keyring, wine charm or ornament). Your business logo can be placed on a COLLECTION for a unique note card and gift combination. You can either purchase a set (note card with either a pendant, keyring, wine charm or ornament included). A high resolution business logo would have to be supplied to us. Pricing is based on quantity and also the assortment of COLLECTIONS. We would send you a wholesale quote based on your requirements for resale. NOTE: You will receive a proof of your order. Once you approve the final proof (proof submitted to you within 2 days after receipt of order), you will be invoiced for the total amount due. Upon receipt of your final payment, your order will be produced. Please allow 14 days for production of your order and 4-5 days for delivery of your COLLECTIONS. Contact Outdoor Eyes Cards for a wholesale quote. 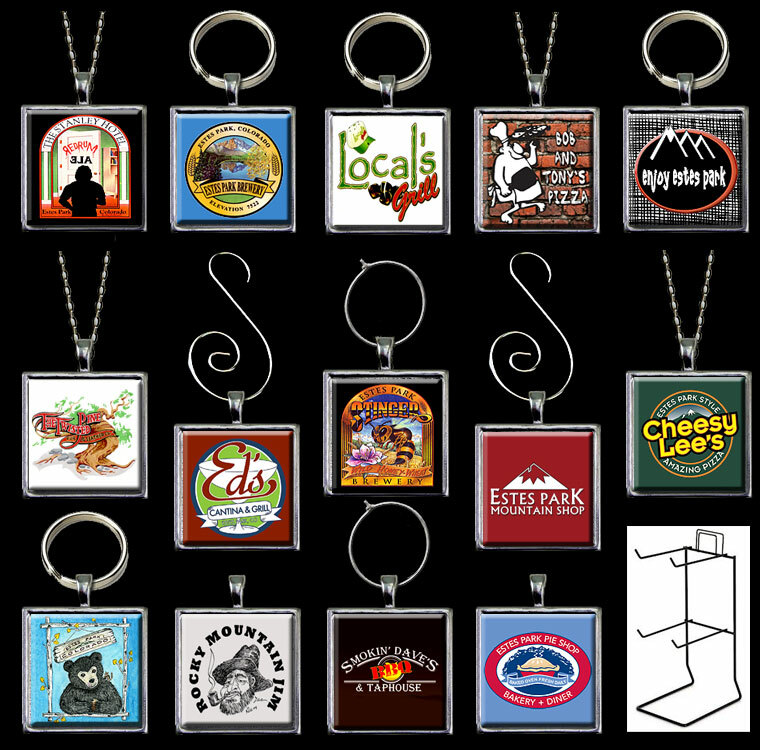 MINIMUM NUMBER OF UNITS ORDERED: The minimum order for CUSTOM BUSINESS COLLECTIONS (with note card and gift) is 20 assorted pieces (pendant, keyring, wine charm or ornament). RACK & SIGN: Rack Not Included. Laminated Sign Included.